A 260 acre farm with pumpkin patch, corn maze, tree houses, trails, classrooms, and special events. Pick your own pumpkins and explore the discovery ride. The address is 2611 Arbor Avenue, Nebraska City, NE. Take a hayrack ride through the forest to the pumpkin field, explore the Old West ghost town or get frightened at the Ranch of Terror haunted house. Your kids will enjoy the How the West Was fun play area. Enjoy the Pumpkin Festival at this Cass County pumpkin patch and educational farm on Fridays, Saturdays and Sundays from the middle of September 29th to October 31st. They have u-pick pumpkins, hayrides, pumpkin painting, rubber duck races, farm animals, corn box and more fun. The farmstead is run by Teresa Lorensen and husband Terry who established it in 1881 and purchased by their grandparents in 1944. A summer camp that puts on fall activities including a Pumpkin Patch and Corn Maze starting the third weekend in September. They have a 350 foot zip line, 9 acre corn maze, pony rides, petting barn, laser tag, and concessions. The address is 9677 County Road 3, Fontanelle, Nebraska 68044. It is about 45 miles northwest of Omaha. 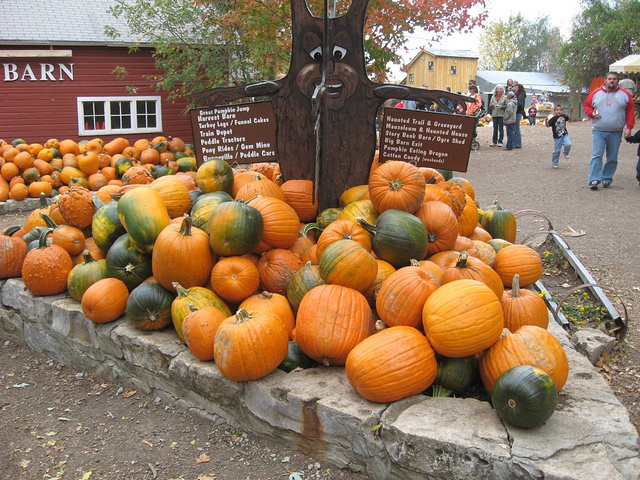 Pick your own pumpkin from their four acre patch with twenty varieties of pumpkins. Also enjoy their corn maze, petting zoo, hayrack rides, trike track, jump pillows and hillbilly bowling. Located minutes from Hastings, it was started by Paul and Ronna Fredricks in 1998. The address is 331 Road 310, Glenvil, NE. It is just 15 miles southeast of Hastings. Take a hayrack ride to pick your own pumpkins. Also enjoy the cornfield maze, tricycle track, slides, barrel train, corn box and zip line. It is located at 43860 Paulsen Road, Broken Bow, NE 68822. This is 103 miles west of Hastings. The pumpkin patch opens for the fall season around the last weekend in September. They have hayrack rides, a corn maze, face painting, bounce houses, train for kids, and concession stands. The address is 10798 726 Road, Holdrege, NE. It is 54 miles west of Hastings. A family farm with a little something for everyone. It features pick your own pumpkins, animals, Zeb’s Ziplines, a 3 acre corn maze, go karts, barn slides, kid’s roller coasters, animals, and much more. They host school field trips, weddings, and events. They are open from around September 19th through October 30th on Friday, Saturday, and Sunday. The address is 1410 Highway 77, Oakland, Nebraska. It is about 60 miles north of Omaha. A 320 acre farm with 80 acres of pumpkins total and a 25 acre u-pick pumpkin field. Also enjoy the hayrack rides, five acre maze of corn, petting zoo, zip lines and other farm activities. The address is 121 Eagle Rd, Saint Libory, NE. It is just 34 miles north of Hastings. The pick your own farm is open Sundays in October. The address is 76472 Road 422, Cozad, NE. It is about 46 miles east of North Platte. Enjoy the country fun with pick your own pumpkins, corn maze, kids activities, hayrides and more. They are open every Friday, Saturday, and Sunday from the middle of September through October. A apple orchard u-pick farm with pumpkins open seven days a week in the fall. They have festivals, apple cider processing, hayrides, cherry processing, and more. The address is 5995 G Road, Nebraska City, NE 68410. It is about 42 miles south of Omaha. Pick your own apples and pumpkins this fall from the orchard. You’ll love their fresh pressed apple cider and kids will love the corn maze, trike track, bounce house (weekends) and wagon rides (weekends). The address is 2024 Ashland Road, Ceresco, NE. It is 18 miles north of Lincoln. Walk through the patch and pick out a pumpkin this fall. Check out the hay bale maze, petting zoo, pony rides, hay rack rides, slides and zip line as well. Don’t miss their Bunnyville. The address is 55275 837th Rd, Norfolk, NE 68701. They are 42 miles north of Columbus. Open weekends in October for pumpkin picking and pre-picked pumpkins at Golden Spike Tower. Hayrack rides, games and cornbox. They also feature a Haunted Hay Maze. Special events include petting zoo, egg hunt, costume contest and pumpkin chunkin’. Located at Union Pacific Railroad’s Bailey Yard, which is the world’s largest railroad yard according to the Guinness Book of World Records. The address is 1249 North Homestead Road, North Platte, NE. This farm has lots of fun activities during the day and three haunted barns for those who want to be scared at night. Take a hayrack ride, go hillbilly bowling, enjoy the giant slide and navigate the cornfield. Pick your own pumpkins or have fun at their Zombie Hunt Paintball shoot. Jeff and Maria Bledsoe will welcome you for pumpkin picking and the ten acre cornfield maze this fall. Take a hayrack ride, try the mad cow train, get your face painted and walk through the petting zoo. It is open every day from the middle of September through October 31st. The address is 3935 Hwy 133, Blair, NE 68008. It is located 16 miles north of Omaha. Gene and Sheila Horak opened their patch for pumpkin picking in 2001 located eleven miles north of Grand Island. Take a hayrack ride out to the pumpkins and choose your own this October. Other activities available include the corn maze, petting zoo, jumpin pumpkin, duck races, tricycle track and zip line. The address is 568 Denton Road, St. Libory, NE 68872. It is 38 miles north of Hastings. The Vala family welcomes you to their 212 acre farm this fall. Pick your own pumpkins from the patch, of course. They grow 40 different varieties of pumpkins and gourds across 55 acres. Also enjoy the three acre corn maze, petting area, lots of farm games, shows, and themed attractions like the haunted farmhouse and haunted paintball shootout. The location is at 12102 South 180th Street, Gretna, NE 68028. It is 16 miles southwest of Omaha. A family owned farm since 1956 that lets you pick out a pumpkin, take a hayride, get lost in the corn maze, paint a pumpkin and play on the playground. They are open every day in October. The location is at 6707 Wenninghoff Road, Omaha, Nebraska 68122. It is just 6 miles north of downtown Omaha.